Yes, there are many things that we can criticize President Donald Trump, but his pro-life activism is not one of them. Perhaps in God's mysterious plan as Pope Francis would say about the multiplicity of religions and universalism in that regard, that God willed that Donald Trump be president to be a voice of reason when it comes to abortion and to be blatant about it. I am beyond sickened by what the Democrat Party has become in this regard and there seems to be no voices in that party standing up for the life of babies. At least in the Catholic Church with our clergy scandals, no one is teaching that what is wrong is good. I am beginning to think that like Fascism, godless communism and other authoritarian governmental models, that Catholics must be told they can no longer belong to a political party that has become as evil as the Democrat Party. What's even sadder is that some bishops and priests support the Abortion Party and have the temerity to offer the Holy Sacrifice of the Mass. In the egalitarian society that Democrats seek, every outrage, every abomination, every character disorder, and every ideology must be accepted and tolerated. To exclude any of them is considered racist, jingoist, homophobic, misogynist, or Fascist. Father, I’m confused by your wording here. Are you saying Catholics can or cannot be told this? Of course I am thinking out loud. But we know that Catholics cannot be Masons, nor can they join the KKK or be Nazis or other racist organizations. Isn't a political party's support of infanticide worse than racism? What say you? Here is a great statement concerning the "Angry ladies on the left." "These angry women could not have better demonstrated who and what the Democratic Party is today. As many have observed, this is not the party of JFK. It is the party of Lenin, Stalin, and Hitler. Those women could not even stand to oppose late-term, post-birth abortion. As Planned Parenthood has been for years, these Democrat women are now in Hitler territory. Next they will be supporting the euthanasia of the elderly. Obamacare tried to do exactly that. That is the slippery slope they have willingly created for themselves. Trump's speech forced them to reveal their callous, murderous agenda for all to see." Demanding a federal bar on late-term abortions isn’t a position limited to the “anti-abortion agenda.” A wide majority opposes overturning Roe, Gallup found last year, but only 28% support legalizing second-trimester abortions and only 13% support legal third-trimester abortions. Trump’s proposal falls within what the vast majority of Americans think are reasonable restrictions on abortion and protection for viable children in the womb. Trump made it clear that it’s the Democrats who have become the extremists, not Republicans. And it’s party leaders like Cuomo and Northam who made it possible. Trump probably should have told these "sophisticates" that their European confreres do not allow late abortions. Then they would have jumped on the bandwagon!! I cannot vote Democrat with a clear conscience anymore. It isn’t just abortion, though that is a major reason. Racist sexist anti religious policies all contributed to my opinion. I do think Church leadership should give a hard statement , but the likes of Fr Martin hint against that. A thought about Catholic politicians: cigarettes are legal and people have a choice to smoke. Anyone ever seen a government advertisement against smoking? What about abortion, everyone has a choice. Has anyone ever heard a Catholic Democrat politician or their government say that it is a poor choice? There is the reason for screaming Excommunicate. Let me begin by saying that I am emphatically not rejecting the teaching of the Catholic Church on abortion (of course, this will make no difference to TJM who will likely launch his vilest attack upon me to date for what I am about to say). When it suits them, many of those who comment on this Blog reject what they demean as “emotion based” reasoning, accusing Democrats of engaging in this (in contrast to those oh so reasonable Republicans I suppose). I suggest that President Trump is the poster child for emotion based reasoning. Is there a place for appropriate emotion based reasoning in our lives? Of course. But there is also a place for facts. So, I suggest that we all (including me) try to establish the actual facts regarding “late term abortions,” immigration, or indeed anything else, and then respond to those facts on the basis of Catholic teaching. That way, we will have much more credibility when talking about abortion—and a much greater chance of actually reducing the number of abortions in this country, late term or otherwise, through the inherent persuasiveness of that teaching. Oh, and it would also be nice—and helpful—to have more women posting on these issues on this Blog since they are the ones who actually carry the developing baby for nine months (the man’s biological contribution to the whole process being, well, miniscule). It's also interesting to note that sacrifice of infants to "the idols of Canaan" was done for the purpose of trying to gain material wealth, and abortion in our time seems to often have those same motives at work: (top 3 reasons-Guttmacher Institute) "can't afford a baby now," "having a baby would dramatically change my life, "don’t want to be a single mother or having relationship problems." Seems the desire for material wealth and comfort outweighs the child's life. 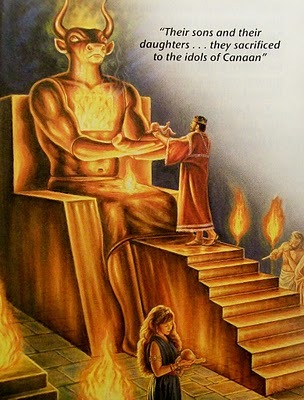 Maybe ancient people thought the gods of Canaan could procure wealth for them if given the blood of an infant, but it seems the same desire for material things in our day are main motives behind our willingness to sacrifice children at an abortionist's clinic. Anonymous 2, you are wrong in regards to Trump's quote on abortion. Yes, there was cheering in the chamber when the Bill passed, and that was documented in the Buffalo News and other Newspapers domestic to my New York State, where I live. There is nothing factually incorrect with what Trump said as a rhetorical characterization, either, for the net effect of the law will result in beautiful unborn babies in the womb being killed. Your argument is a distinction without a difference. It is clear that you have no real objection to the murder of the unborn. I pray you repent, because you are wrong to think the holy God of ours will give you a free pass on this. I certainly cannot judge you, but God will hold you accountable on this issue. You are a fraud as a Catholic, an academic, and a man. The Washington Post has morphed into a far left-wing rag. They attacked Justice Kavanaugh, a fellow Catholic, based on NO evidence and the simpleton notion that "every woman must be believed" (unless they are victims of your hero, Horndog Clintoon). They elected to play partisan hack and protect the Lt. Governor of Virginia when credible evidence of molesting a woman was present. Why? Because he is a member of the Party of Moloch, the Abortion Party, formerly the Democratic Party. Juat like your fellow traveler, Kavanaugh, I have obviously hit a nerve and you can't let it go. I recommend you go to confession and ask God's forgiveness for voting for the Party of Moloch. Immigration does NOT rise to the same level as abortion. Only a braindead or intellectually dishonest political hack would try and make a moral equivalence argument there. Even your European "betters" do not allow late term abortions like the fanatics in the Abortion Party advocate. "Notice the rhetoric—lawmakers cheering at beautiful babies being ripped from wombs just before birth; executing babies after birth. However, the factual accuracy of this statement and this rhetoric has been challenged. See, for example:" and then gives a link to a Washington Post article. Unfortunately, the link is blocked and asks for payment in order to read the article, so I have no idea what "fact" was disputed by the Washington Post. Trump wasn't really far off from describing the actual situation, was he? There did seem to be lots of smiles and happy faces among those standing around when the bill was passed. -Dilation and Evacuation (D&E) "where pliers-like instrument are inserted through the cervix into the uterus. The abortionist then seizes a leg, arm or other part of the baby and, with a twisting motion, tears it from the body. This continues until only the head remains. This abortion is also used on mid and late term babies, from 4 to 9 months gestation. Ultrasound is used to identify how the unborn baby is facing in the womb. The abortionist inserts forceps through the cervical canal into the uterus and grasps one of the baby’s legs, positioning the baby feet first, face down (breech position). The child’s body is then pulled out of the birth canal except for the head which is too large to pass through the cervix. The baby is alive, and probably kicking and flailing his legs and arms. The abortionist hooks his fingers over the baby’s shoulders, holding the woman’s cervix away from the baby’s neck. He then jams blunt tipped surgical scissors into the base of the skull and spreads the tips apart to enlarge the wound. All of these methods are quite gruesome, and certainly the words "ripped from the mother's womb" seem to be somewhat accurate. And allowing for a child to die or be killed after birth, depending on the decisions of the mother and doctor, well, that's just infanticide. It is an execution. Not even criminals get that treatment. Notice the politicians who are for this kind of thing refuse to address what actually happens in an abortion, but make sure to frame it as a "womens' health" issue. I hope the truth comes out someday...how abortion really affects women, and how many, although not all, regret it and experience deep psychological and emotional pain for the rest of their lives which they often can't talk about since so many around them "supported their brave decision to have an abortion." So very sad. Tragic all around. Oh yes, Anonymous 2, and it is reported that lawmakers and bystanders gave a standing ovation when the law was passed. How is that much different from Trump's statement "Lawmakers in New York cheered with delight upon the passage of legislation..."
"We affirm also the importance of awakening religious awareness and the need to revive this awareness in the hearts of new generations through sound education and an adherence to moral values and upright religious teachings. In this way we can confront tendencies that are individualistic, selfish, conflicting, and also address radicalism and blind extremism in all its forms and expressions. "The first and most important aim of religions is to believe in God, to honour Him and to invite all men and women to believe that this universe depends on a God who governs it. He is the Creator who has formed us with His divine wisdom and has granted us the gift of life to protect it. It is a gift that no one has the right to take away, threaten or manipulate to suit oneself. Indeed, everyone must safeguard this gift of life from its beginning up to its natural end. We therefore condemn all those practices that are a threat to life such as genocide, acts of terrorism, forced displacement, human trafficking, abortion and euthanasia. We likewise condemn the policies that promote these practices. . . .
"Good relations between East and West are indisputably necessary for both. They must not be neglected, so that each can be enriched by the other’s culture through fruitful exchange and dialogue. The West can discover in the East remedies for those spiritual and religious maladies that are caused by a prevailing materialism. And the East can find in the West many elements that can help free it from weakness, division, conflict and scientific, technical and cultural decline. . . . "
My post at 9:03 p.m. was in response to Bee’s post of 7:38 p.m. It should make it very clear where I stand on the issue of abortion, as should the first sentence of my post at 5:27 p.m. I have now seen the posts beginning with Bee’s post at 7:38 p.m., which were all published along with my 9:03 p.m. post. These other posts demonstrate an inability or an unwillingness to give what I wrote a fair reading. However, this is understandable and forgivable, given the highly emotive nature of the topic. We are all on the same side here. I have said before on this Blog that I would like there to be zero abortions. But it does our cause no good to distort the facts (and yes, Bee, I am also fully and painfully aware of the facts you adduce in your post at 8:55 p.m.). So, if we want to critique the New York law or the Virginia law, we have to do it on the basis of the facts, not inflammatory rhetoric by the Gaslighter-in-Chief. "Lawmakers in New York cheered with delight upon the passage of legislation that would allow a baby to be ripped from the mother's womb moments before birth." "Abortions are not performed at 40 weeks on healthy, viable pregnancies," Villavincencio said. "Overwhelmingly, abortions that occur at this point in pregnancy are pregnancies where lethal fetal anomalies have been diagnosed." "We had the case of the governor of Virginia where he basically stated he would execute a baby after birth." In an interview with a Washington radio station, Gov. Ralph Northam, a pediatric neurosurgeon, talked about what would happen if doctors determined that a woman in labor carried a child that was nonviable or severely deformed. "The infant would be delivered," Northam said. "The infant would be kept comfortable. The infant would be resuscitated if that's what the mother and the family desired. And then a discussion would ensue between the physicians and the mother." The proposed law would lift a current mandate that at least three doctors agree that a third trimester abortion is necessary for the protection of the mother's physical or mental health. By the way, I told my wife that I would be crucified on the Blog for daring to defend the idea of facts and truth in my 5:27 p.m. It seems I was right. But, as I said above, it is understandable and forgivable. Yes facts and truth matter, so why are you posting here? You support an evil Party and even Father McDonald is suggesting a faithful Catholic cannot belong to it any longer, and be a good Catholic. I am sure there are circumstances in which a clinical abortion is appropriate, but I do not believe there are that many. Having worked for much of my career as a chaplain in a Developmental Disabilities institution, I have witnessed the love and care given to children, from birth to death, in these institutions by staff members who see their work as a calling and not just a job. They love these children and treat them as if they were their own. These children grow to adulthood and experience a reasonably full life with normal day-to-day experiences and interactions with family, friends and staff. Many eventually go home to live after they achieve self-care skills and a certain level of social skill. Others remain and are given every experience of "normalcy" possible, with family visits, frequent outings to movies, sporting events, and shopping trips...even beach trips. Given the increase of group homes and private placements, on balance I believe we are much farther along in our understanding and care of the Developmentally Disabled. I know there are still failures, but they are much less frequent. All of these things make possible a quality life for those who might otherwise be aborted. Abortion is murder...so, we either become comfortable with that or seek every avenue for providing these folks with a viable and meaningful life beyond the womb. I was asked many times by staff members, "Why does God put them her?" My answer was always the same, "He puts them here for us, to make us better people by glorifying God in our care for them." I have met Anon 2 and had lunch with him. He is a good man, but sometimes misguided. This is not due to ignorance (indeed he is better educated than most of us), rather to the fact that he is a rationalist and an attorney, which lends itself to analytical thinking and a tendency to weigh matters to which you and I have an immediate reaction. However, some matters need no weighing. I do not believe he is pro-abortion but, like the academic characters in Swift's Gulliver's Travels, tends to analyze to the point of indecision. I always found it quite ironic that the Kennedy family supports the Special Olympics and in the next breath are fire breathing abortion droolers. God cannot resolve a contradiction but apparently the Kennedy's can do so. I am actually an attorney in an international law firm with a JD but an LLM. I deal in the practical world, I suspect he does not. He continues to twist himself into knots. You cannot be anti-abortion and still vote for the Party of Moloch. If the Republican Party had a slobbering love affair with abortion like the Dems, then I fully understand he would have latitude in this regard. If only Piux XI were alive he would condemn the modern Democratic Party as he did the Nazis, Fascists, and Communists. should have said "and an LLM." Thank you for the testimonial. I appreciate it. I also appreciate your eloquent post at 8:55 a.m. and have some personal understanding of such matters in my own family. As a member of the legal profession—a professor of law and an English barrister by training (also with an LL.M from the University of Michigan)—I am trained to weigh matters. The weighing comes after the same immediate reaction you and TJM had to the notion of aborting babies in “late term abortions.” No lawyer worth his salt will act without such weighing, whatever his or her immediate reaction. Even “thinking on one’s feet in the moment” is only done well when it draws on much ingrained experience, which is the result of past weighing and reflection. Indeed, it is in this habit that the lawyer’s distinctive practical wisdom largely consists. This is something that TJM surely understands, and indeed something that he surely practices as an international lawyer. Analyzing and weighing matters is, of course, an important aspect of critical thinking (a quality that seems to be in increasingly short supply nowadays). In my case, this inclination combines with a complete revulsion at dishonesty, lying, and mischaracterization (which seem to be in ever increasing supply nowadays and the poster child for which now inhabits the Oval Office). This is not just a matter of moral principle, however. It is also rooted in a very practical concern that such dishonesty, lying, and deception is not only counter-productive because it erodes the credibility and trustworthiness of those who engage in it (or, I would add, of those who support it when practiced by their favored politicians); it also poses a major threat to our Republic (especially as we know that hostile foreign powers are deliberately propagating false information on social media in an attempt to divide us). In short, the end (even if that end is to combat the scourge of abortion) does not justify the means (dishonesty, lying, and deception), and it is also our patriotic as well as religious duty to resist it. No one was more into prevarication than Bill "Horndog" Clintoon and Barack "Abortion King" Obama. I could produce endless lists which would make Trump look like a Boyscout by comparison. No one was a greater threat to our Republic than Obama, who left the US naked to our enemies, and was a massive violator of civil rights. But your partisanship is blinding your judgment. How a thinking Catholic could support the Abortion Party is stunning. If the US had an effective AG, Obama and his minions would be behind bars, including Hillary Clintoon. After all, Martha Stewart went to jail for far less. I know you wouldn't be popular in the faculty lounge if you expressed those views. Most faculties are nothing more than empty headed, left-wing shills. It is your patriotic and religious duty to repudiate the Abortion Party, the greatest threat to our religous freedom. Just ask the Little Sisters of the Poor. To the extent these explanations for differences are valid, perhaps this is yet another reason why we can be grateful to have a comprehensive moral compass in the form of Catholic social teaching! Well, I am pretty immediate in my reactions to certain issues because I know without question where I stand. The Christian's moral values should shape their public persona and their political views. Is that not what we are called to do? So, how can I say, for instance that, as a Christian, I am against abortion but if I get elected governor I will support it? It is the law of the land but, while I cannot deny people that legal right, I can certainly openly condemn it as a bad law. Christian witness should not be a parenthetical aspect of our personalities. Christian attorneys, judges, DA's etc. must often be put in tough spots regarding the law of the land and personal belief. their labor and resources. All of this is a result of the anti-life spirit abroad in the world. It is beyond politics... I am a conservative, but many conservatives would be upset with me for saying these things. The point is that we are dealing with the things Paul talks about in Ephesians 6: "...for we wrestle not with flesh and blood, but against principalities, against powers, against the world rulers of this darkness, against spiritual wickedness in high places." All political problems are spiritual problems. So, who is going to stand on the US Capitol steps and scream to the powers and principalities, "Repent and believe the Gospel?" Anyone? Anyone? The fact that you have an LLM and a JD does not change the fact that you will have will be judged before the throne of God. Do those degrees mean we must give greater weight to your opinions? Are we to be impressed by your degrees? God is not. Rather, God loves you and wants you to use theses gifts he gave you (whether you are an academic attorney, a litigator, or a transactional attorney) to help your brothers and sisters, and that means you must use them to fight for justice for the unborn, to allow them to live and grow in holiness before God. What good are those degrees when, at your personal judgment before our most holy God, it will come down to whether you supported the murder of unborn children or opposed it? God does not care whether you are liberal or conservative, God cares whether you love your unborn brothers and sisters to allow them to born and live and grow before God. I have a JD and MA and am a practicing attorney with my own practice, helping the rural poor in Appalachia. Yes, all of us attorneys are taught in law school to weigh matters." But, long before law school, we were taught right from wrong, to make moral choices. No matter what we determination we make to arrive at a position in the legal profession, we still must look at the objective nature of the act, the subjective motive and the subjective circumstances. And, no matter how you nuance it, abortion is murder and you must do what you can to oppose it. So, I will pray for you and may we meet in heaven before the golden throne of our lord and Savior Jesus Christ. As you seem willing (albeit grudgingly?) to engage in serious adult conversation, I will respond to you. You would have more credibility with me (and I suspect some/many?) other readers if you admitted Trump’s failings instead of always seeking to defend or distract from them. You do see that, don’t you? The topic of Father McDonald 's article was abortion, not Donald Trump. Yet, you have attempted to turn this into a discussion about Trump, but the issue is not the President, it is about the murder of preborn children. It is "adult" to stay on topic and not go on irrelevant tangets. Let us go down your "adult" path for a moment. If you think Trump is such a dreadful man, a liar and so on why do you not act as a good Catholic and give Father McDonald some money for masses to be said for the President's soul? What good are you doing judging him? None, but only increasing vituperation and animosity. Pray for the President,and, again, why not have some masses said for him? You evidently did not read Father McDonald’s post. The entire first paragraph of this three paragraph post is all about Donald Trump. Why do you assume I do not pray for President Trump? I have only just read your post from 9:05 p.m. on February 7. If you are suggesting at the end of your post that the real and lasting solution to all these issues is inner transformation (metanoia) rather than external constraint, legal or otherwise, I agree completely. We need to discover our true selves and the Source of Life beneath the dead encrustations of our false, socially constructed egoic selves, both individual (“I want money, power, fame, this, that, or the other, etc.”) and collective (e.g., “USA, USA”). But this is so wretchedly difficult for all of us. The damnable things keep on getting in the way. But for God all things are possible, no? Regarding your post at 9:14 p.m. on February 7, which I have also only just read tonight, no, I do not expect you to be impressed by my degrees (I don’t have a JD by the way, but the English equivalent). I did not mention my degrees for that reason at all (which if you knew me, you would know) but rather in order to explain my “weighing” approach to issues. I think you must be confusing me with Donald Trump, who is always telling us about his great education and how smart he is—indeed how much smarter he is than anyone else, about everything—which, of course, only a very insecure person needs to do and which also is further evidence that he is not very smart at all (although he is certainly very cunning). On the issue of abortion I have nothing to add to my post at 12:07 a.m. on February 7. I believe it responds to your concerns. Please read it if you have not done so, or please read it again. I would add only this: Why do you assume that I do not fight for justice for the unborn? Because I am not a Trump supporter? Because I have sometimes voted Democrat (as well as Republican)? Please refer to the USCCB document on “Faithful Citizenship.” You will see that I am not required in conscience to vote for just one particular candidate or one particular party. Moreover, there are many ways to fight for justice. By the way, I commend you for being a lawyer who helps the rural poor in Appalachia. I appreciate your last sentence and wholeheartedly reciprocate. "Donald Trump, who is always telling us about his great education and how smart he is—indeed how much smarter he is than anyone else, about everything"
Really Anonymous, your bias is showing, and I don't think you are "weighing" the facts. Now you’re just being silly—cute but silly.